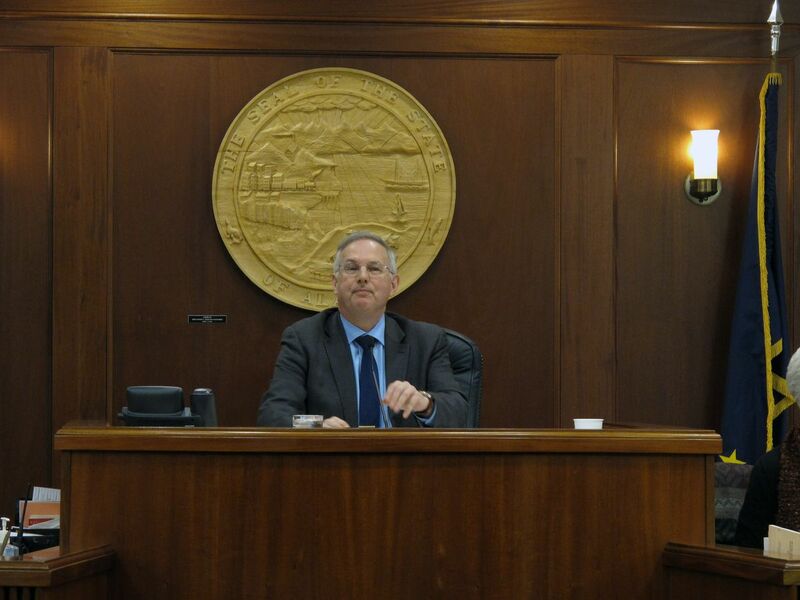 JUNEAU — The record 30-day leadership deadlock in the Alaska House of Representatives has ended. House lawmakers voted 21-18 in a Thursday morning floor session to pick Dillingham Rep. Bryce Edgmon as speaker of the House. Edgmon, who was elected as a Democrat and served for the past two years as House speaker, switched his voter registration to “undeclared” earlier this week. Edgmon told reporters Thursday that helped get a majority organization together. Edgmon’s election means a coalition majority will control the House. The numbers and makeup of that coalition are not yet set, but it will include Republicans, Democrats and two independents. Edgmon said Reps. Chuck Kopp and Jennifer Johnston — both Anchorage Republicans who were the swing GOP votes in favor of Edgmon as speaker — will be part of the majority, with Kopp slated to be majority leader. A coalition majority is much more likely to be an impediment to Gov. Mike Dunleavy’s budget plans than a purely Republican majority. “I think what you’re seeing is a coalition come together to say that is unacceptable,” said Rep. Ivy Spohnholz, D-Anchorage, about the governor’s proposal to significantly cut state services in order to pay a larger Permanent Fund dividend without tax changes. Rep. Dan Ortiz, I-Ketchikan, agreed. “I think that the organization that we will eventually see will definitely be able to stand up better for the budget overall and for the issues that we’re united on, whether it’s Power Cost Equalization or the university system, or the marine highway,” he said. Edgmon on Thursday said he also expected Fairbanks Republican Rep. Steve Thompson and North Pole Republican Rep. Tammie Wilson to be part of the coalition majority. Edgmon said Thompson was set to be House Rules chair and that Wilson and Democratic Rep. Neal Foster of Nome would be House Finance Committee co-chairs. Messages were left for Thompson and Wilson. Thursday was the 31st day of the legislative session, and without a permanent speaker of the House, lawmakers there have been unable to introduce legislation or officially consider bills proposed by the governor. “We are almost five weeks into brokenness as an Alaska House of Representatives. We have an institution that has ground to a halt,” Kopp said on the House floor. On the floor, Johnston quoted former U.S. Sen. Ted Stevens. “I’m going to say to hell with politics, I’m going to do what’s right for Alaska. And what’s right for Alaska is that we get this house in order and make it functional,” Johnston said. In November’s election, voters picked 23 Republicans, 16 Democrats and one independent to serve in the Alaska House. That would theoretically give Republicans the numbers to control the chamber, but the Republican delegation is divided. Reps. Gabrielle LeDoux, R-Anchorage, and Louise Stutes, R-Kodiak, the two other Republicans who voted for Edgmon as speaker, supported last session’s largely Democratic coalition majority. That left 21 Republicans, the bare minimum number needed for a majority in the 40-person House, but Rep. Gary Knopp, R-Kenai, broke from a nascent Republican majority in an effort to create a new coalition majority. Knopp said at the time that he viewed a bare-minimum majority as unworkable and likely to collapse amid acrimonious budget debates. Knopp’s decision, coupled with the existing divide in the House — 19 members aligned with last session’s coalition majority declined to join Republicans in a new majority — meant no one had the 21 votes needed to elect a permanent leader. Lawmakers made various attempts to break the deadlock, without success. Earlier this week, Knopp said the deadlock had gone on long enough, and he pledged to vote for a Republican speaker of the House. The presumption was that would be Rep. David Talerico, R-Healy, whom Republicans unsuccessfully nominated several times. Instead, Knopp voted for himself after being nominated by Stutes. On Thursday, Knopp was absent from the Capitol on a previously planned trip back to his home district, he said by cellphone. “With bipartisan support, they didn’t need my vote,” he said. He hopes to join the new coalition if offered a spot, and said he thinks Thursday’s organization is “a start to build that coalition concept” he envisioned in December. Kopp, meanwhile, said he decided to vote for Edgmon after an extended bout of negotiations. “No side went to the other; it was just a lot of people coming together to make it happen,” he said of the decision to change votes. The House adjourned its Thursday session without setting committee assignments or determining committee chairs. A committee on committees meeting has tentatively been scheduled for Friday, as has another House floor session, coalition spokesman Mike Mason said early Thursday afternoon. Some information in this story was reported by The Associated Press.